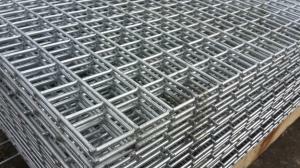 One of the most popular galvanised welded wire mesh products. Manufactured from 1mm/19swg steel wire, the mesh is supplied with a 1"x1" square aperture (25.4mm). A multitude of uses including garden fences, pet control, dog fencing and vegetable protection on allotments. Our galvanised 3ftx10m welded wire mesh is protected from rust corrosion from its hot-dip galvanised protection treatment ensuring that the metal mesh fencing can be used in all weather conditions, all year-round, year after year.